Xanthisma spinulosum often grows in large weedy-looking, but lovely colonies spaced out over many hundreds of square feet. Leaves are thin, branched, numerous, and intermeshed giving the plant a raggedy, unkempt appearance. Adding to the disheveled appearance are last year's dried flower stalks. Once new flowers appear, the plant becomes a mass of gold floating on top of silvery green leaves. In 1804 Meriwether Lewis collected the first specimen of this plant on the prairies of now South Dakota, and in 1814 Frederick Pursh named it Amellus spinulosus. 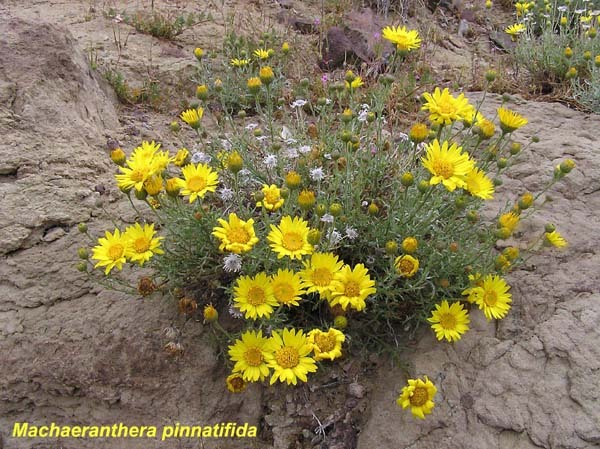 Since then the plant has undergone a number of genus changes: Machaeranthera pinnatifid, Haplopappus spinulosus, etc.